True to its name, Paintball World Cup Asia was a fierce battle between teams from over 32 countries from around the world. 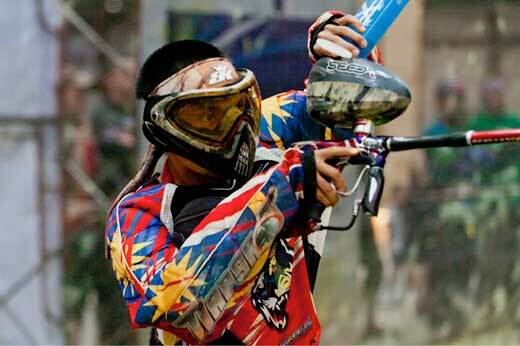 The World Cup Asia (referred to as WCA) hosted 1,810 paintball players hailing from 152 paintball teams. Teams competed in an indoor facility on astro-turf and millennium series bunkers. The layout itself lent to a defensive style of game play with 5 of the larger bunkers based in the back of the field. Paintball website View from the Deadbox had a spot on analysis of the game play. The final match up for the PALS World Cup Asia was hosted last night in the beautiful Langkawi, Malaysia. Hailing from Iran, Team Datis retained their World Cup title in a match up against Reaper from South Africa (final score 4-1, Datis). Team Datis played a no-nonsense, methodical game of paintball throughout the event. The players remained focus and respectful throughout and were the clear winners. ProPaintball.com is currently in Malaysia and will follow up this story with information and final thoughts on the event, the country and paintball abroad. Stay tuned. Special thanks to Dez from ResidentEvilChef.com for use of these awesome paintball photos.